Filtering is emerging as an important programming abstrac- tion in distributed object systems. We discuss the modeling capabilities of a first class filter object model in the context of distributed systems. Filter objects are transparent objects that are dynamically pluggable and provide selective filtering of messages. Filters can be injected into a system to dynamically evolve the system. The method is demonstrated with the help of an example application, a Transparent Distributed Dec- orator. 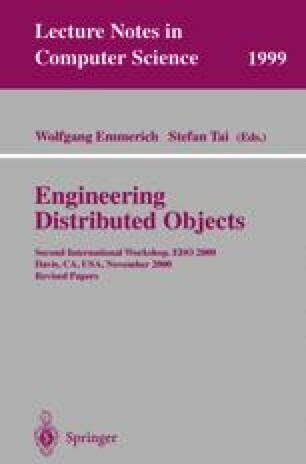 A notation for representing static (class and object) and dynamic (interobject interactions) models in presence of filtering abilities is also discussed. Object Management Group. : CORBA Specifications, http://www.omg.org.